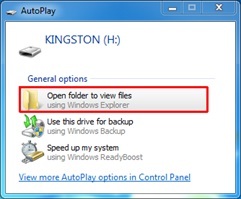 If AutoPlay dialog appears select Open folder to view files. EncryptUSB application starts and displays the Create Password Enter a password twice (and a Hint) and click OK.
That’s all. Now every file created on the drive will be encrypted automatically. You will see a notification from the Windows notification area (system tray) once you create a file on the drive. If you open EncryptUSB application (by clicking on the EncryptUSB icon in the notification area) you’ll notice confirmation that your file was encrypted. ▲ Sample of file encryption confirmation.